By MadJik, May 24, 2007 in Plugins - Publishing ONLY! Thanks to BoltBait and Illnab1024 who created the original version and published the sources of it. 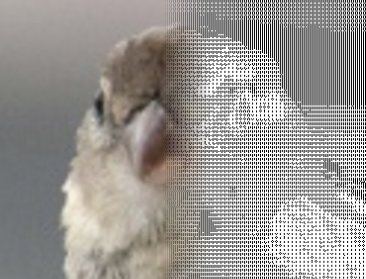 __from 1 to 1000, choose the size of the single cell of the grid/checker in pixels. __if checked Horizontal and Vertical move both at the same value. 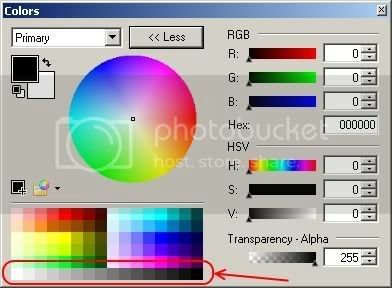 __if unchecked you could give differente values to Horizontal and Vertical. 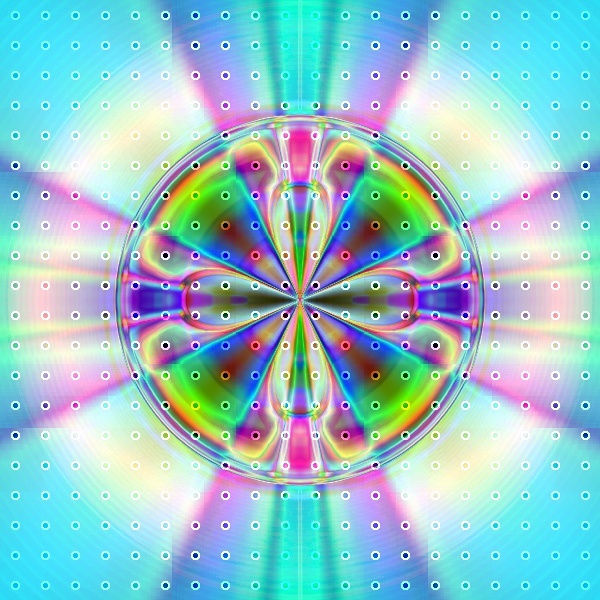 __Alpha only: the effect fills only transparent area. __Foreground only: only draws the primary color. 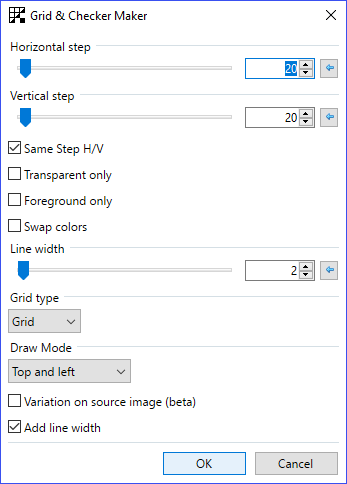 __Line width: Is a slider to select the brushwidth "live". By default it is set to 2. 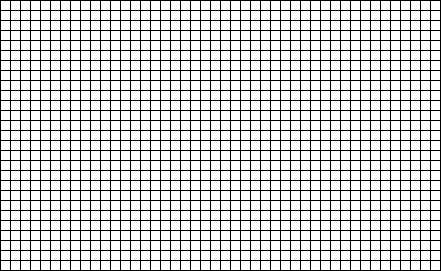 Fill each cell of the grid with a circle. The radius is the minimum value between horizontal and vertical grid step. You could use the brush width to create a "gap" between circles. Good catch... Changed and uploaded ! What is the effect that says "Border" and where did you get it? It's one of the Enormator's effects. Edit: I just had a quick check & it isn't sorry. My laptop has... twice the PDN Functionality of this computer. Time to get up to date! Also, yeah I'm back from being banned. From my PC. Many thanks to MadJik (and earlier builders) for the Gridmaker plugin. This solves an immediate problem for me. 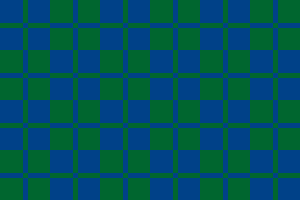 I particularly needed the ability to control grid size and line width, something I haven't figured out how to do with the pattern options for the paintbrush fill selections. However, being a pig, I'd like to see more pattern options than simply grid and checkerboard. The paint brush fill patterns, for example. 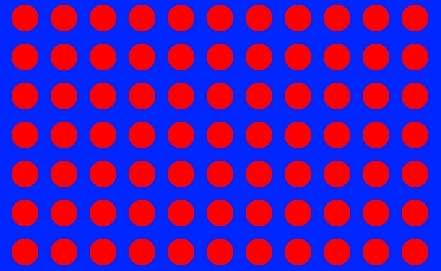 Dots in Grid = Awesome!!!1! *Runs to update the "Halftone Background Tutorial"
Hey MadJik, I feel bad making another request, but, would you be able to add a "Dots in Checker Board" option? 1.Do the dots on one layer. 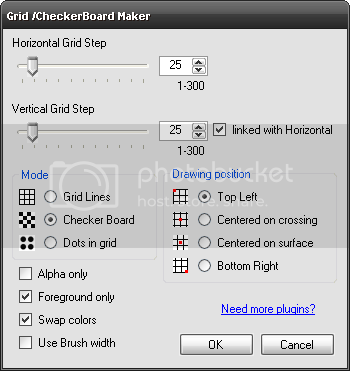 2.Do the checker with the same setting on another layer. Don't worry, for my purposes I need to blur them anyway. What's with the link? :? @Boltbait: he's using your palette. @Boltbait: he's using you're palette. MadJik always struck me as VERY intelligent and creative. This piece of information merely confirms it. My wife strikes me too....so I have to say that she is VERY intelligent. The link to the first post !